By Chris Williams: WBA World middleweight champion Ryota Murata (13-1, 10 KOs) will be making his first defense of his WBA ‘regular’ 160lb. strap against Italy’s Emanuele Felice Blandamura (27-2, 5 KOs) on April 15 on ESPN2 from the Yokohama Arena in Yokohama, Japan. The Murata vs. Blandamura will be televised on April 15 on ESPN2 at 8:00 a.m. ET/5:00 a.m. PT. It’s not exactly a fun time for boxing fans in the States to be tuning in to watch boxing that early in the morning. Unless they’re big fans of Murata, this is a fight that will likely be missed by the casual boxing fans in the States. It’s good that Murata-Blandamura will be shown on ESPN2, but the televised time for the fight is terrible. 2012 Olympic gold medalist Murata is signed with his co-promoter Top Rank, who has a deal with ESPN to have their fighter’s televised on that network. The 32-year-old Murata is a big star in his native Japan, where he brings in lots of boxing fans for his fights. Top Rank saw the potential in Murata after he turned pro, so they quickly snatched hi up. Despite being the WBA secondary middleweight champion Murata hasn’t fought anyone of quality yet. He struggled and lost to Hassan N’Dam by a 12 round split decision in their first fight last year in May in Japan. Some boxing fans thought it was a robbery, but N’Dam made it close enough for the judges to give him the fight. In their rematch last October, Murata defeated N’Dam conclusively in stopping him in the 7th round. Murata left no doubts with that emphatic victory. The 38-year-old Blandamura is ranked #8 with the World Boxing Association. Blandamura is an 11-year pro without much to show on his resume in terms of wins over quality opposition. In fact, there are no quality wins on Blandamura’s resume. He stepped up twice during his career against Billy Joe Saunders and Michel Soro and was knocked out both times in the 8th round. I saw the Saunders-Blandamura fight in July 2014, and I couldn’t help thinking that Blandamura looked like someone that stumbled into the ring wrong. It was a mismatch with Saunders hammering the poor over-matched Blandamura. If Murata defeats Blandamura on April 15, he’ll need fight unbeaten 2012 Olympian Esquiva Falcao (20-0, 14 KOs) in July in a fight that will be in Las Vegas, Nevada, according to ESPN. Murata beat Falcoa of Brazil by a controversial 14-13 score in the 2012 London Olympics. Boxing News 24 had Falcoa winning that fight over Murata. It was It was one of the many controversial decisions that occur in the Olympics. In the same Olympics, super heavyweight Anthony Joshua controversially won a gold medal after beating Italy’s Roberto Camarelle and Cuba’s Erislandy Savon in fights that he appeared to lose. Joshua is from the UK. Murata will likely stay a champion as long as his promoters at Top Rank can match him against guys like N’Dam, Blandamura and Falcoa. As soon as Murata fights someone good like Daniel Jacobs, Demetrius Andrade or Sergiy Derevyancehnko, I see him losing badly. I’m just wondering how long Murata can last as the champion in not having to fight those guys? 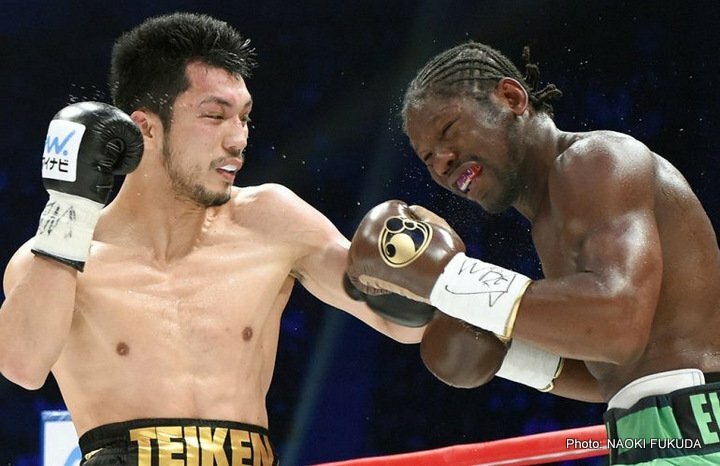 If the World Boxing Association takes their time ordering Murata to defend his WBA title against one of the above-mentioned fighters, he could hold onto his title for a long time.